This blog has spoken before about what our founder feels is the finest sandwich of all time, and just this week wrote about his search for a banh mi that might replicate that experience. Another of our contributors has weighed in on what he feels is the finest sandwich he has eaten. Although the search for the finest sandwich is a quest that one hopes will continue until one’s dying day, it is one of the most noble undertakings I can imagine. Certainly, I have had a number of fine sandwiches, and recall the best experiences with aplomb. But today I am not here to talk about the finest sandwich I have ever eaten. I am here to talk about something else: my favorite sandwich. The finest sandwich and the favorite sandwich are two entirely different beasts. I will illustrate with an example: Suppose you, at age eighteen or nineteen, are on a road trip. It doesn’t matter where. Say, from New York to Philadelphia. Or from Atlanta to Pensacola. Or from Sacramento to Los Angeles. Or from Des Moines to Denver. Or from Cleveland to Austin. Along the way, you spy a diner, or a sandwich counter, or a drive-in, or a greasy spoon. For whatever reason, you feel compelled to stop. You order a sandwich off the menu, and it is the finest sandwich you have ever eaten. It propels you for the duration of the trip. When you think back on it, the corners of your mouth curl upwards — ever so slightly — all on their own. Several years later, at age 23 or 25, you are taking a similar trip, and stop in at the same place. If it is, in fact, still in business (no guarantees there), the sandwich probably pales in comparison to that first experience. This is all too often the case. There is no promise that the finest sandwich you’ve ever eaten at a given location will hold up on repeated visits. You must hold on to those memories. Even the master sandwich maker may have an off day, or burn the bread slightly, or cook the bacon too long, or use a slightly-too-under-ripe tomato. We don’t often touch on chain restaurants in this forum, because chain restaurant sandwiches are mostly of low quality, or are pedestrian, or boring, or there is nothing much to say. If you have had a French Dip at a Coco’s, you have had the French Dip at Baker’s Square, and at Lyon’s, and at Denny’s, and at Carrow’s, and at IHOP, and a hundred other similar restaurants. Which is not to say that these are bad, or good, but certainly there is no comparing these to the original French Dip at Philippe’s, a dipped sandwich without peer. Marie Callender’s is a ubiquitous chain in the western half of the United States. Not seen on the low level of Denny’s or Applebee’s, but certainly not much better. There is scant little I enjoy on the Marie Callender’s menu, up to and including their famous pies. However, they serve my favorite sandwich, and I say this with my head held high. The turkey croissant club — although some may pick nits with its labeling itself a club sandwich — is a marvelous creation, and I recommend it to anyone in need of a warm sandwich in an unfamiliar location. 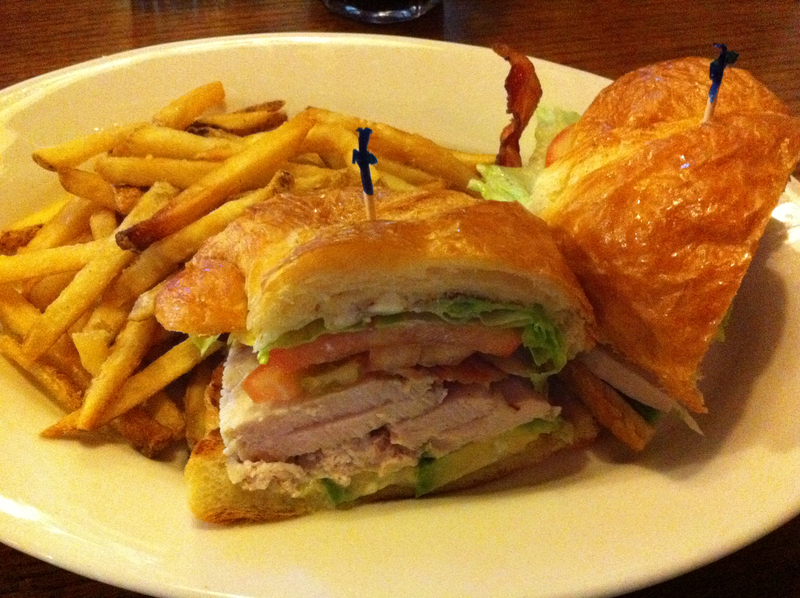 The meal itself is fairly straightforward: turkey, lettuce, tomato, bacon and avocado, served with mayonnaise on a croissant. There are two aspects here which truly make it stand out. The first is the croissant, never too flaky or too buttery, which is sliced and both halves lightly griddled before building. The second is that the turkey is fresh-sliced to order, and kept warm. Warm turkey on a sandwich is a rarity, and one bite of this sandwich will have you scratching your head and wondering why. The crisp bacon, snap of lettuce, and firmness of tomato offset what would otherwise be an overwhelming creaminess of the remaining elements. I can find no fault with this creation. Indeed, were it not served at a chain restaurant, one may hear of this sandwich in hushed tones among those in-the-know. As I say, this is my favorite sandwich. My constant, as it were. It is not the finest sandwich I have eaten to date, but it is always there for me when I need it. I hope all of you have a sandwich you think of as fondly. This entry was posted in General Sandwich Discussion, Sandwich Reviews and tagged Los Angeles, Reviews by Bill, Sandwiches I Have Eaten, Turkey by bengrimm. Bookmark the permalink.